Meet Frank Mortin. For more than three years, he's been playing EVE. In that time, he has learned how to... mine in highsec. Sort of. Agents of the New Order discovered Frank mining in an untanked Hulk. Frank neglected to fit any shield tank in his mids. His lows and rigs were left completely empty--a major oversight, especially when mining in New Order space. Frank contacted one of his gankers to learn more about the game. His curiosity about the reason for the gank appeared to be sincere. But as we've seen over the years, miners like to ask this question much more than they like to hear the answer. Frank demanded the sum of 300 million isk for his 233 million isk ship. He also claimed he was having fun playing with friends. Agent Aaaarrgg noted that Frank "was AFK mining by himself. Hardly playing with friends." Aaaarrgg was skeptical and told him so. The miner's limited supply of patience ran out. He again demanded to be reimbursed. Immediately. Meanwhile in local chat, Agent Pod-Goo Repairman had been helping Aaaarrgg spread the blessings of the Code. He gave the miners plenty of warning in local, but this gesture, of course, went unappreciated. Frank's unsuccessful bid for a 300 million isk payment left him angry and frustrated. He returned to local chat and requested guidance from fellow German-speaking players. It was then that Frank noticed Pod-Goo Repairman in local. The miner deduced that our Agent had been connected to the ganking of his Hulk. A confrontation ensued. For some reason, Frank had developed a really bad attitude about the New Order and its Code. Hoping to prevent Frank from stirring up rebellion among the local miners, Pod-Goo asked Agent Aaaarrgg to invite the miner to a convo. It was preferable for this matter to be hashed out in private. Aaaarrgg spoke frankly. Perhaps the belligerent German miner would be grateful for his directness. Frank proved to be ill-equipped for a career in space law. At the very moment he accused Aaaarrgg of not following the Code, he confessed to being too engrossed with "the market" to watch local. Fewer and fewer miners these days have an excuse not to read the Code; it's available in multiple languages, including German. Frank took Aaaarrgg up on his suggestion to send me an EVEmail to request reimbursement. When he was finished, he hedged his bets by also submitting a petition to CCP asking them to ban Aaaarrgg for shooting a spaceship. Some GM is going to have a good laugh in a few months. Frank perused the German translation of the Code. Now he was interested in buying a permit for 10 million isk, but only if he received 500 million isk for his Hulk. 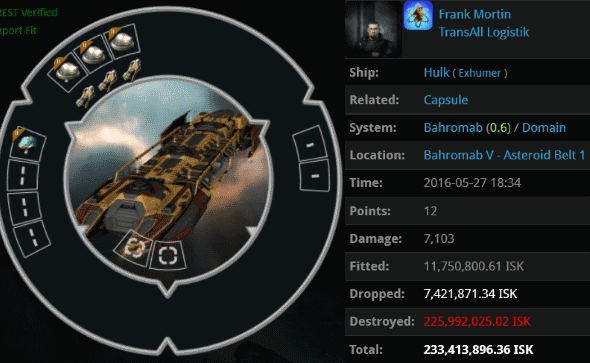 Barely more than an hour earlier, Frank had quoted the Hulk's value at only 300 million isk. EVE inflation has gotten totally out of control. The miner was disappointed that he didn't receive an immediate reply to his EVEmail. FYI, the New Order petition system is currently backlogged. Please be patient. For faster service, send multiple petitions. It never fails to astound me that destroyed miners think they have a NEGOTIATING POSITION when dealing with agents. The agents just destroyed you with little effort, they are not afraid of you. They seem to think it works as it does in RL. If you whine loud enough for long enough, you'll get what you ask for - and then some. Why 999mill? Why not just round it out to an even billon?! "Some GM is going to have a good laugh in a few months." I read the post title and my day was complete. Our Saviour never fails to deliver! Inflation is crazy these days. It seems AG finally gave up whining anonymously on our blog to get attention. \o/ The Code always wins! give them time to pick up the mic that James dropped. so many amazing turns of phrase. my only question is where is Mr Normus?